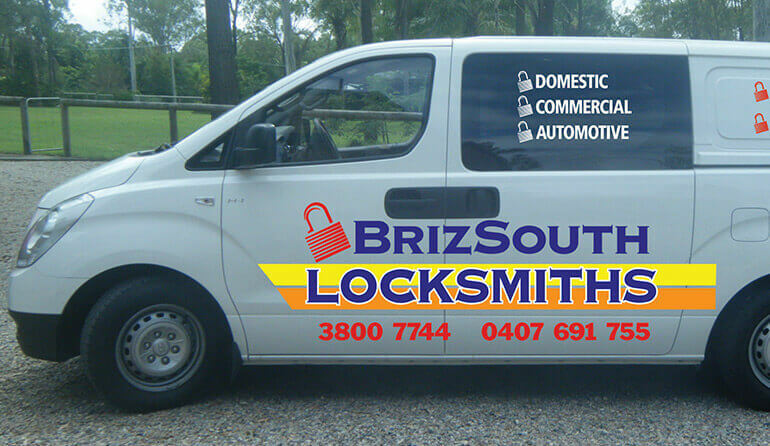 BrizSouth Locksmiths is a locally owned and operated family business that provides residential and commercial locksmith customers with a mobile locksmith service you can trust. Throughout Brisbane South, including Woolloongabba, Yatala, Ipswich and Beaudesert, our mobile locksmith works quickly, economically and professionally, and we guarantee quality services and products for all mobile locksmith jobs – large or small. With nearly 20 years of operation in the mobile locksmithing trade, we offer practical, economical solutions to all your lock and key problems, and our mobile locksmith can fit new locks, remove broken keys, cut spare keys and gain access when you lock yourself out. In 2000, Paul Benson launched his Brisbane South mobile locksmithing service after spending almost 30 years in the profession. Four years later, he then expanded by opening a workshop on Tradelink Road in Browns Plains as well, making his locksmith services more accessible to customers as they could easily drop off their keys and locks. Paul’s son Nick then took up the family trade by beginning a locksmithing apprenticeship in 2005, and in 2009 he proudly became a fully qualified locksmith and member of the BrizSouth locksmiths team. This father and son team now run the workshop and mobile locksmith service together; providing professional locksmith workmanship at the best possible price. As members of the Master Locksmiths’ Association, we guarantee all our work, and customers can always expect reliable, economical results. At BrizSouth Locksmiths, we value all of our customers and we take your privacy very seriously, so you can rest assured that we will ensure your security at all times. We are dedicated to providing a quality mobile locksmithing service and our team of qualified mobile locksmiths will always maintain professional and discreet conduct you can rely on. Design and install Restricted (Do Not Copy) key systems to your requirements. Call our office today to arrange our mobile locksmith to visit, and you will be impressed by our great prices, excellent customer service and attention to detail, as well as our knowledge and passion for all locksmith products and solutions. Thanks for doing a great job. Very affordable and friendly service.